Online shopping is increasingly becoming the norm for consumers -- and that isn't necessarily good news for shoppers or companies. Gallup has found that more than one-third (35%) of American adults are doing more of their shopping online than they were a year ago. The movement was in full effect over Thanksgiving weekend. The National Retail Federation reported that more consumers shopped online over the Black Friday weekend than in brick-and-mortar stores. And this year's Cyber Monday was one for the record books, with consumers spending almost $3 billion, according to the Adobe Digital Index. But not all retailers had a great Cyber Monday -- and not because they were lacking in deals or customers. Major chains angered and frustrated shoppers when their websites failed to keep up with demand. Some Target customers were forced to wait in a "virtual line" on Cyber Monday, while Wal-Mart and Neiman Marcus also experienced technical difficulties over the Black Friday weekend. These retailers invested a significant amount of time and money to promote their online deals. Yet when it came to delivering the ideal customer experience, they fell short -- and this lapse could have unfortunate side effects. Gallup research has shown that the more a customer shops online, the more likely he or she is to become antagonistic toward a brand. Among retail customers overall, one in four are actively disengaged. But among customers who shop online more often and who shop the same or less offline, about one in three (32%) are actively disengaged. Having a bad experience in a digital channel can also offset any goodwill a company has built up through its other channels. Customers no longer judge a brand by a singular experience in a channel, but take it as a sum of its parts. In a study of banking customers, for example, Gallup found that engagement dropped by 30 percentage points when these customers gave anything less than a "5" rating (on a 5-point scale, with "5" being the highest) to any specific banking channel, even if they gave every other channel a perfect score. Overall, retailers are struggling to engage their online customers -- and failing to provide access to their websites during the biggest online shopping weekend of the year does them no favors. 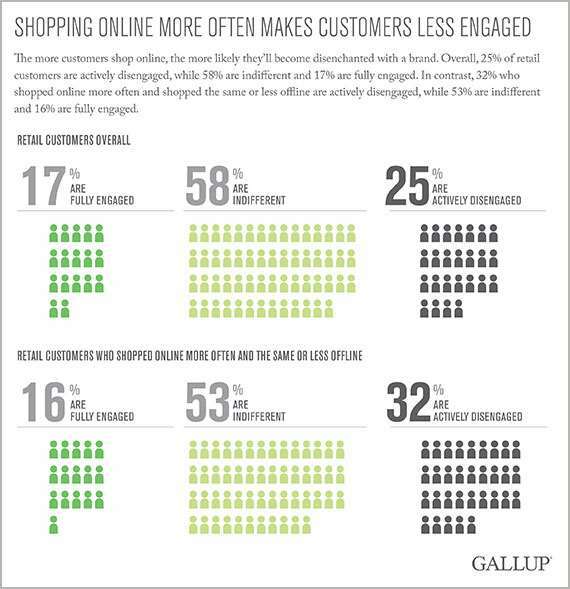 Gallup research has revealed that just 16% of customers who shop online more often and shop the same or less offline are fully engaged. Customers have limited tolerance for a company's online blunders. Online shopping is often devoid of any person-to-person contact, making it more difficult for companies to forge emotional relationships with their customers in the digital space. This scenario means they must try even harder to perfect their online presence and ensure that customers have an engaging user experience. Improving digital touchpoints. Retailers must ensure they can support all customers during an all-out promotion such as Cyber Monday. But a slow or hard-to-navigate website will always be a source of discontent for customers who shop or make purchases in an increasingly digital world. Getting the technology right is paramount to the customer experience. Retailers need to make it easy for customers to do business with them. Once businesses ensure they have technology that works, they can look at other features and functionality that work to improve customer engagement. Gallup has studied the most powerful factors in creating customer engagement in an online environment and has found that customers prioritize service features above product features. Most importantly, online shoppers want to be able to count on the online retailer to resolve any problem that occurs. They also want great customer service, quality for the price and a smooth shopping experience. Approaching problems as engagement opportunities. When problems occur, the best companies use them as opportunities to emotionally engage their customers. But before problems even happen, these companies look back to their brand promise and create a clearly defined strategy for resolving them. Gallup has found that a six-step process works well for handling problems. Surprisingly, when customers are very satisfied with the way their problem was handled -- regardless of whether the problem was resolved -- slightly more of them are fully engaged (54%) than is true for customers who did not encounter a problem (50%). Thinking holistically about the brand promise. Despite the growth of digital channels, customers still shop in brick-and-mortar stores, and they still call customer support centers. The customer experience involves more channels than ever, and because of this, businesses should consider each and every touchpoint and how these align with each other. Customers should not have one experience in a store and another on that store's website. Their experience with a brand needs to be seamless. Often, companies create strategies for their various channels in isolation without considering their effect on the overall or omnichannel customer experience. When separate teams don't communicate or share information, their silo mentality creates a disjointed brand experience. Leaders and managers should get their employees talking and working together. And they must ensure that all employees, whether they work behind a counter or a computer screen, know what the company as a whole is doing and how they are expected to deliver the brand promise in each of the company's respective channels. Finding ways to connect with customers. Engaged customers have an emotional connection with a company or brand. In the digital world, it can often be hard to develop this type of connection, but it is possible. Companies must emphasize service and provide customers with access to employees through features such as live chats. Helpful employees are one of the most important elements in creating and sustaining customer engagement. Retailers can also implement technology that allows them to personalize recommendations for customers or enable a more individualized experience -- one that is effortless, fun and makes customers feel special. But all is not lost when problems occur. Companies can take steps to fix their mistakes and recover engagement. It's for this reason that digital retailing must take a sharper look at the online experience. 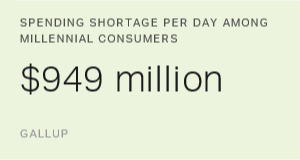 The State of the American Consumer: Insights for Business Leaders report highlights findings from Gallup's ongoing study of the American consumer from 2008 through 2014. This report provides insights into what leaders can do to improve customer engagement and organizational performance.